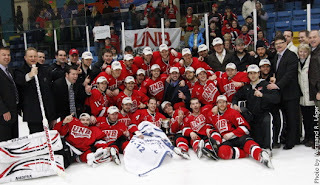 We didn’t get as much drama as we might have expected, but the UNB Varsity Reds swept the Université de Moncton Aigles Bleus in three straight for back-to-back AUS men’s hockey titles, and their twelfth conference championship all-time. Now the stage is set for UdeM to revenge 2007 and win the University Cup, against UNB, on their home ice, in overtime. No big deal, right? Moncton coach Serge Bourgeois more or less admitted that many of his players seemed to be looking past Game 1 of the AUS championship towards the Cavendish University Cup. UNB wasn’t. It showed. UdeM goalie P.-A. Marion had a 1.00 GAA in the playoffs coming into the game. The V-Reds scored twice on 4 shots in the first half of the period, and by the middle of the second period Marion had given up five goals and was out of the game. Not that the goals were really Marion’s fault as his teammates did little to help him out. Moncton did score two goals in the third period, both on 5-on-3 power plays, to salvage some pride. Nick MacNeil led the UNB offence with a hat-trick. Moncton didn’t have much time to recover, as both teams were back at it the next night in Fredericton. This was a very entertaining game. Moncton got the early lead thanks to sloppy play by UNB defenders in their own zone. UNB tied it up on the power play, and then went ahead in the second period on a point shot by Jonathan Harty. Another point shot a couple of minutes later gave them a two-goal lead before Moncton replied with a power play goal. Late in the period UNB captain Kyle Bailey scored on the power play and that was all the goals. But there was lots of hitting. Lots. And twice UNB goalie Travis Fullerton gambled and came way out of his net in the second period to win races for loose pucks, with the second time only a UNB d-man preventing a Moncton goal. With the two-goal lead the V-Reds ground out the third period and prevented UdeM from getting many good scoring chances to get back in the game. Sunday the series moved to Moncton for the must-win game in front of a full house, including many UNB fans who made the 1:45 hour drive down Highway 2. There was an odd vibe in the building, as all game you could sense Moncton fans wanted to have something to cheer for, while at the same time maybe resigned to the fact that UNB was playing too well. The V-Reds had to kill off an early 5-minute major to Thomas Nesbitt, and not only did they do that but when they were back to even strength the V-Reds went down the ice on an odd-man rush and scored on Marion. Less than three minutes later UNB added a power play goal, and then for good measure another on the PP five minutes after that. Fullerton, playing his first game of the season in his hometown, was stellar in the UNB net and had perhaps his best game of the season as he continually robbed the Moncton shooters. It got chippy as the second period wore down, but fortunately both teams appeared for the most part to be aware of the consequences of suspensions and the upcoming Nationals. UNB outshot Moncton 108-57 in the three-game series, and outscored them 16-5 with 7 goals on the power play. Marion was made to look mortal and the V-Reds special teams improved as the series moved along. 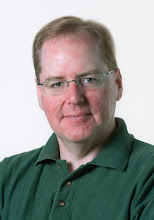 The Varsity Reds are really clicking now, especially Chris Culligan who won the playoff scoring race with 13 points in six games, and now they have to wait around until March 22 for their next game. I’m confident Moncton will learn from this series and bounce back at Nationals, especially since Christian Gaudet made his tentative return to the UdeM line-up on Sunday for the first time since January. The final Top 10 poll comes down tomorrow, and that will set the University Cup seeding for conference winners UNB, McGill and Saskatchewan. UNB is in the evening pool, which puts Moncton in the afternoon pool. Going by the CIS regulations I’m pretty certain the Redmen and Huskies will also be assigned to the afternoon poll, making it the Pool of Death™, while the V-Reds will make nice with UQTR and Western.